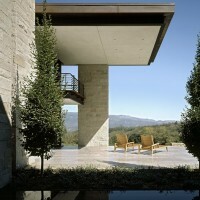 Aidlin Darling designed a vineyard residence in California’s Sonoma County. 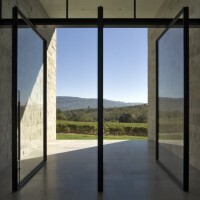 Carefully situated on the edge of a vineyard, this rural residence engages its surroundings in establishing a frame of reference for one’s experience of the site. 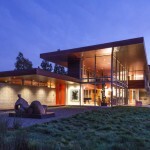 The design negotiates three basic criteria: private residence, expanded art preserve, and vineyard operation. A careful manipulation of building, landscape, and topography facilitate a poetic coexistence of programs and site, as well as serving to understate the size of the main residence. The architecture quietly reciprocates the complexities of site and program, facilitating a variety of experiences and daily routines. 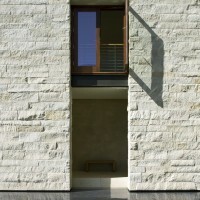 The process was approached with a deep reverence for the act of making, and a consonant respect for the land. Grounded in an exploration of cartography, the resulting structure facilitates one’s understanding of the site and mapping of place – physically, temporally and metaphorically. 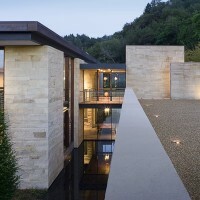 The house is sited at the base of Sonoma Mountain, affording expansive views across the vineyards and valley to the east. 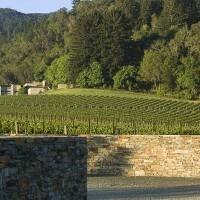 Its placement among the vines brings the vineyard and its seasonal cycles directly into the life of the house. Its orientation and elongated profile allow passive heat gain on cool mornings, and provide shade on hot afternoons. 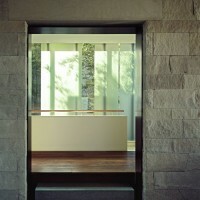 This also allows light to penetrate the house in a variety of ways throughout the day. 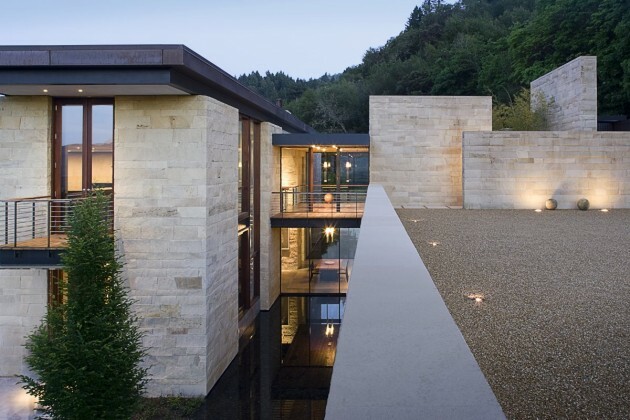 A long reflecting pool, its water level in measured contrast to the rolling ground plane, runs from an intimate southerly forest, through the house to panoramic northern views. The monolithic pool functions as an abstract reference datum; it structures the arrival sequence and daily routines. 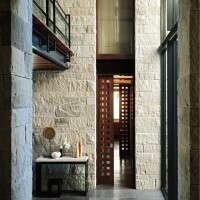 Domestic spaces are organized along its length, and a parallel loggia provides a meditative walk between the different phases and activities of the day. 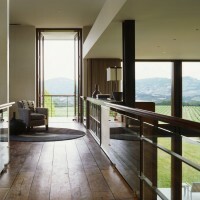 Perpendicular to the pool is a narrow footpath, which connects a series of garden rooms on the eastern side of the vineyard to a subterranean wine cellar adjacent to the dining hall. Linking site and program to the course of the sun, the path embodies metaphors of a lifespan, from birth to burial, from creation to consumption. The crossing of these two cardinal axes defines a conceptual center at a void in the body of the building. 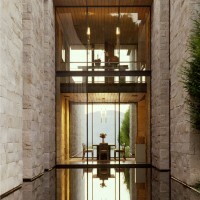 It locates entry to the home at mid-level and the dining room on the lower floor, centering the ceremonial spaces of arrival and departure and of communal dining. The choice of materials and their detailing support this spatial and temporal narrative through one’s tactile experience. 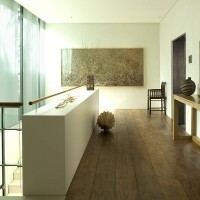 Wood and stone floors convey an understanding of one’s position relative to the ground. 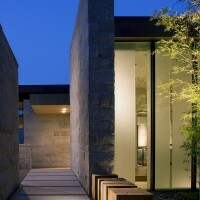 Heavy stacked-stone walls are juxtaposed with light steel framing to establish a narrative hierarchy; their interaction creates a range of spatial conditions, from intimate enclave to expansive open space. The visual, tactile and acoustic qualities of each material contribute to a mnemonic mapping of the house and its landscape. 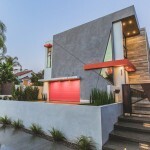 Visit the Aidlin Darling Design website – here.